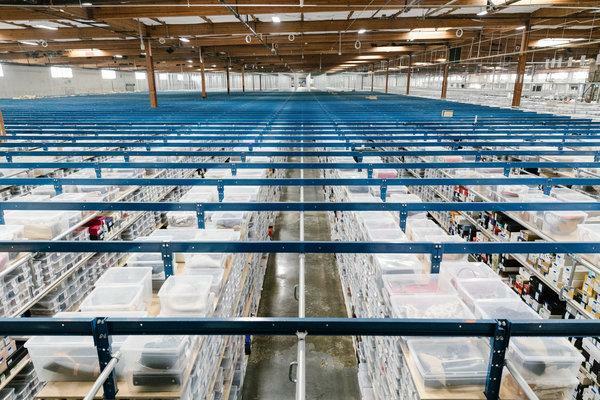 BRISBANE, Calif. — Here is where high-end Marie-Kondo’d clothes go now — not to die, but to enter their collective half-life, in a chilly 200,000-square-foot warehouse about eight miles south of San Francisco. Here is row upon row of garments made by Hermès and Prada and Versace: a few seen last season sailing down a runway, or yesterday on Net-a-Porter, contained in white shrouds or sealed inside transparent Tupperware, awaiting shipment around the world to a growing cohort of Secondhand Roses and Josés. Here experts in lab coats squint at handbags and shoes, looking for errant stitching or the wrong color of brass hardware: anything that might signal sophisticated fakery. Here is a special atrium just for inspecting jewelry, brightly lit like a surgical theater, where stones and metals are weighed and laser-beamed to determine if their advertised composition is correct. “We zap ’em,” Julie Wainwright said. Ms. Wainwright is the founder and C.E.O. of this operation, the RealReal, a.k.a TRR, which since 2011 has striven to make the consignment of luxury goods — once a furtive, grubby practice carried out in obscure second-floor shops — easy-peasy and seamless with free shipping labels, just one stop in something called “the circular economy.” Other oft-used terms at TRR are “scale,” as in up, up, up (it has leased almost half a million more square feet in Perth Amboy, N.J., adding to an existing smaller space in Secaucus); “authenticate” (the laborious process by which the company validates previously owned goods) and “velocity” (how fast inventory moves). As legacy department stores continue to ebb at an alarming pace, and Amazon flows into Long Island City but not our hearts, TRR, which also sells furniture and art, is proposing a new model for how people of both means and conscience might shop IRL. With cafes and “community workshops” akin to those held by Apple, its sleek, spacious brick-and-mortar locations on Wooster Street in New York and on Melrose Avenue in Los Angeles have been surprisingly successful. “Remember there was that whole thing, ‘Millennials don’t love luxury’? They looove luxury!” Ms. Wainwright said. “They just couldn’t afford it. We’re a good entry point for them.” Another multilevel store is being plotted for Midtown Manhattan, with services including refurbishment, tailoring (“like an atelier,” said TRR’s chief merchant, Rati Sahi Levesque), personal shopping and a ticker-tape display of which designers are trending up or down. This is hardly consolation to Chanel, which in November sued the RealReal in federal court, charging that the consignment company has sold fakes and misleads consumers into believing it has an affiliation with the French fashion house. Only Chanel personnel can tell what is truly Chanel, says Chanel. “They are trying to stop the circular economy,” responded TRR in a statement, adding a motion to dismiss the suit, still pending. Ms. Wainwright is herself a model of personal refurbishment. Still, Ms. Wainwright was not your obvious online-luxury slickster. She grew up the eldest of four in South Bend, Ind. : the family putting on plays and making “bad” wine out of plums, apples and grapes that grew on their property, among other wholesome analog pursuits. Her father was a commercial artist and salvage enthusiast (“he loved going to the dump,” she said) whose accounts included the Shakespeare fishing-gear company and Flintstone vitamins. Her mother, who had intended to become a fashion illustrator, was struck with a debilitating illness, which proved to be multiple sclerosis, when Julie was 8. A homecoming queen, she matriculated at Purdue University, switching her major from organic chemistry and pharmacy to business after helping her older boyfriend with his marketing homework. They got engaged but she called off the wedding five weeks beforehand. “I felt I’d raised my brothers and sisters and I just wanted to be all that I could be,” she said. Ms. Wainwright still dislikes shopping. But “I like buying,” she said. TRR’s most devoted clients, like Nicole Curran, wife of Joe Lacob, majority owner of the Golden State Warriors, now count on the company to help keep them aboard an ever-rotating carousel of flash. “I take more risks in what I wear now,” said Ms. Curran, whose was wearing, among other striking garments, gold-sequined thigh-high boots for a morning visit to a hushed consignment office — one of eight around the country for those who don’t feel like putting their valuables in a postage box — at the company’s headquarters in Fisherman’s Wharf. “I find that I can be a little edgier and fun in the things that I wear,” Ms. Curran said as a miniskirted sales manager, Jenna Suhl — sales managers also pay in-home calls — cooed over piles of Fendi, Valentino and oui, Chanel. Later that afternoon, inoffensive jazz played softly in the background as a new and nervous consignor, Lindley Hollender, a private-wealth analyst, watched as a strand of pearls were rejected on the basis of market saturation, along with a pair of Theory pants (accepted only with tags, or if they are suede or leather) and a floral Roberto Cavalli gown (excessive soil). A white Alice + Olivia wrap dress had promise, though. “If you are able to get the stains out,” Ms. Suhl said gently. “You have a good eye,” Ms. Hollender said. Two months later, though, she had not yet consigned with the company; after a dry cleaning bill, the 40 or 50 percent commission she would get on the sale of a “contemporary” piece would probably not be worth the trouble. But Ms. Wainwright and her colleagues see infinite possibility in such customers, whom they hope to convince to renounced fast fashion, buy less frequently but better-quality, and maintain those purchases carefully before joining this sisterhood and brotherhood of the traveling pants and purses, shirts and shoes, coats and coffee tables. The way we shop now. These clothes have previously touched another human body.